A prescription for a successful job search includes a standout resume that sets you apart from the crowd of competitors. So if you're looking for top pharmacist jobs, ask yourself this: Does your resume focus on the right skills and experience to impress hiring managers, or is it past its expiration date? 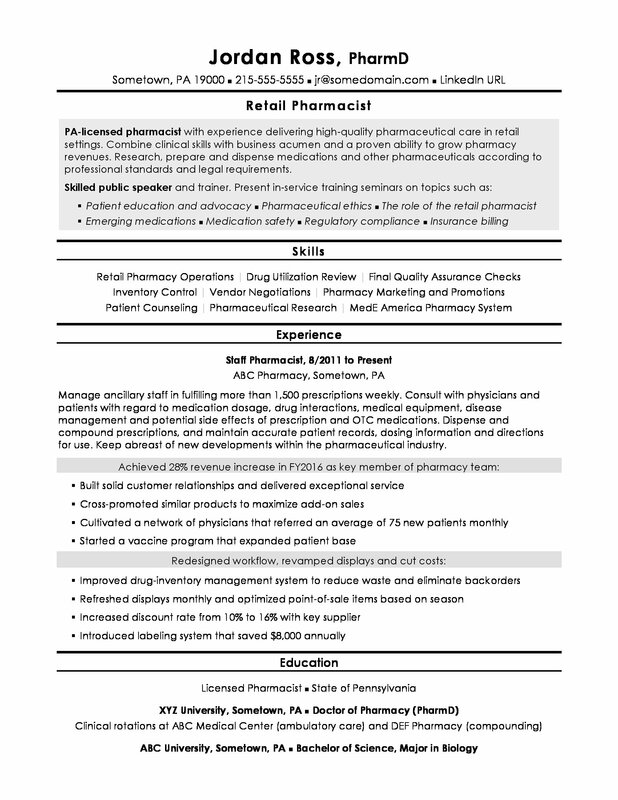 If you can't say for sure, review this sample resume for a pharmacist below to see how you can convey your smarts, and download the pharmacist resume template in Word. Jobs for pharmacists are projected to grow by 6% (or 17,400 jobs) from 2016 through 2026, according to the Bureau of Labor Statistics (BLS). You'll find the highest level of employment for this job in the following states: California, Texas, New York, Florida, and Pennsylvania; and in the following metropolitan areas: New York City, Chicago, Los Angeles, Houston, and Atlanta. As a waitress, you can expect to earn a median wage of $124,170 per year, or $59.70 per hour, according to the BLS. PA-licensed pharmacist with experience delivering high-quality pharmaceutical care in retail settings. Combine clinical skills with business acumen and a proven ability to grow pharmacy revenues. Research, prepare and dispense medications and other pharmaceuticals according to professional standards and legal requirements. Manage ancillary staff in fulfilling more than 1,500 prescriptions weekly. Consult with physicians and patients with regard to medication dosage, drug interactions, medical equipment, disease management and potential side effects of prescription and OTC medications. Dispense and compound prescriptions, and maintain accurate patient records, dosing information and directions for use. Keep abreast of new developments within the pharmaceutical industry. Before you deliver a prescription to a patient, you double-check to make sure it's correct. You want to do the same with your resume before you apply to jobs. Could you use some help making sure your resume is healthy enough for a job search? Get a free resume evaluation today from the experts at Monster's Resume Writing Service. You'll get detailed feedback in two business days, including a review of your resume's appearance and content, and a prediction of a recruiter's first impression. Let the experts at Monster show you how to put your best professional foot forward and help you get the job you want.